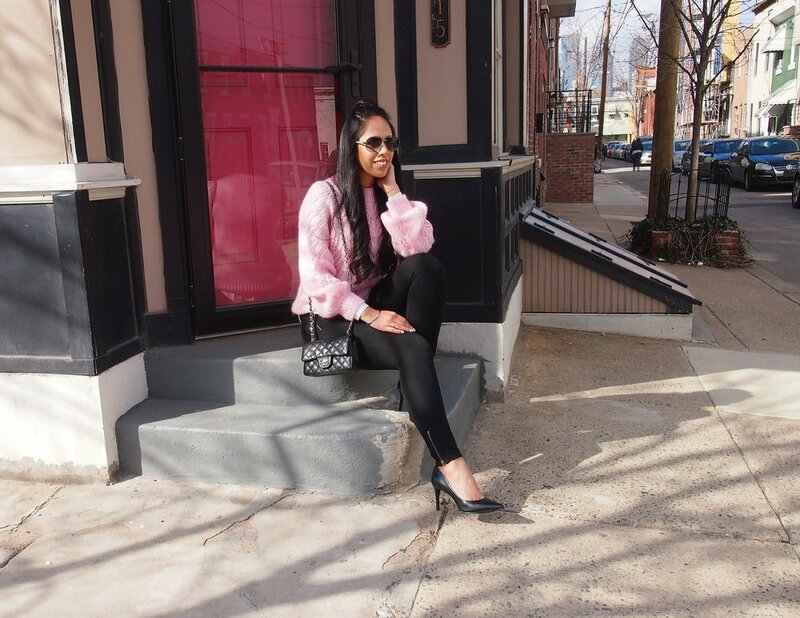 One trend I am loving for spring and summer are two-piece sets! I love that these sets come with fun prints and are colorful which are perfect to wear on a vacation or a night out. Another reason why I love two-piece sets is that you can mix and match them so easily which allows you to get so much more use out of each piece. For instance, you can take the top and pair it with jeans or shorts. Likewise, you can take the bottoms and match them with a different top. The options are literally endless! 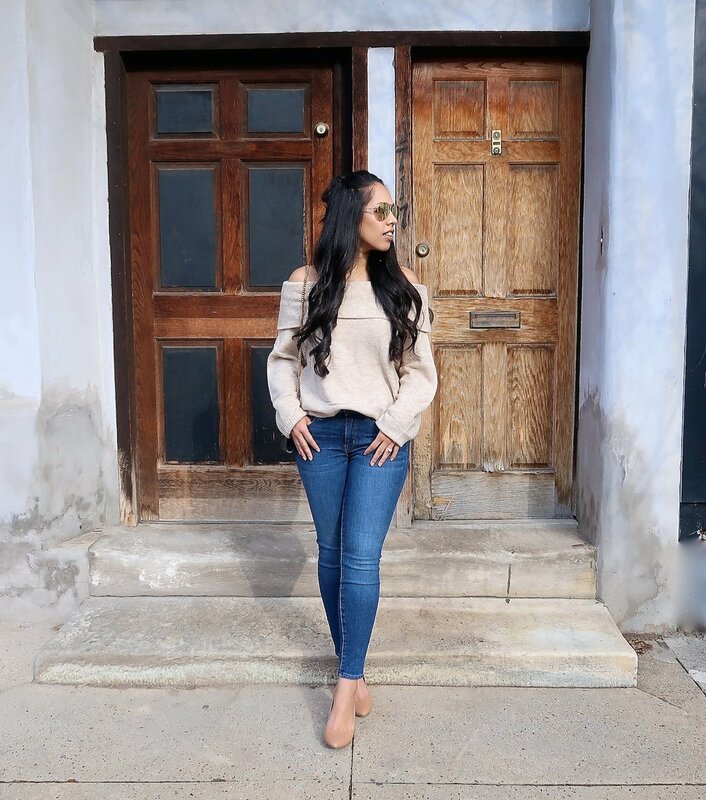 Click on the widget below to shop my favorite picks! Happy Thursday everyone! I’m happy to say that spring is FINALLY here and as you can see I'm all about spring fashion! The temperatures have been in the 80’s here in Philadelphia and I’m loving it! I can finally say that I am ready to put away my winter clothes and do a spring cleaning! Who else does a wardrobe switch-out each season? I usually try to do it twice a year – once in the fall and once in the spring. The way it works is that I take out all my clothes for the season and create three files - toss, donate, and keep. It honestly feels so good afterwards when your closet is clean and organized! I'm also happy to say that pleated skirts are back for spring but updated for the season with pretty pastel colors! One of my new editions to my spring wardrobe is this beautiful mint colored midi pleated skirt. When I put it on my husband was like wow “I love that color and skirt on you!” It’s honestly perfect for spring and it’s under $50! I paired this look with heels to keep the look dressy for the evening but this pleated skirt would also be super cute paired with white sneakers! I’ve linked a few other of my favorite pastel pleated skirts in the widget below. Right now I am craving everything and anything spring! 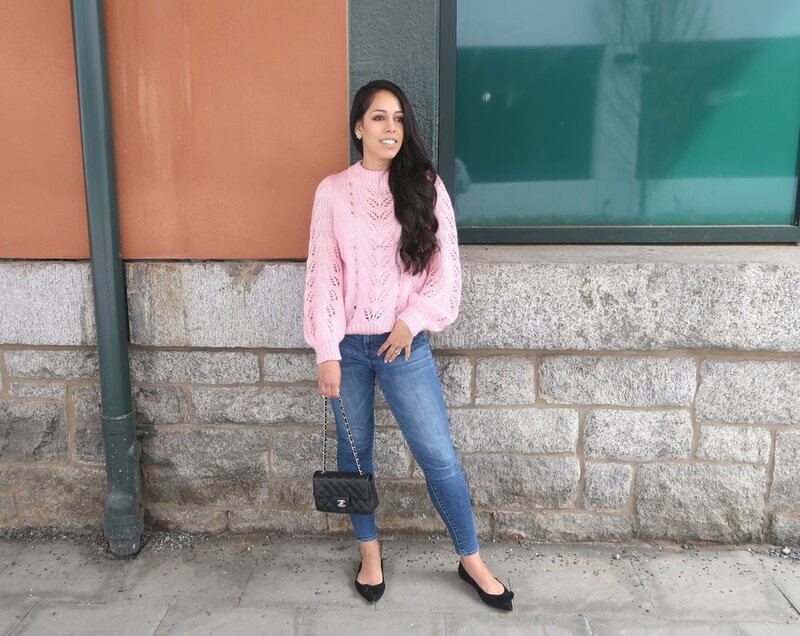 I am totally loving this beautiful pink loose knit sweater from H&M which is a total dupe for this $475 knit sweater from Ganni!! 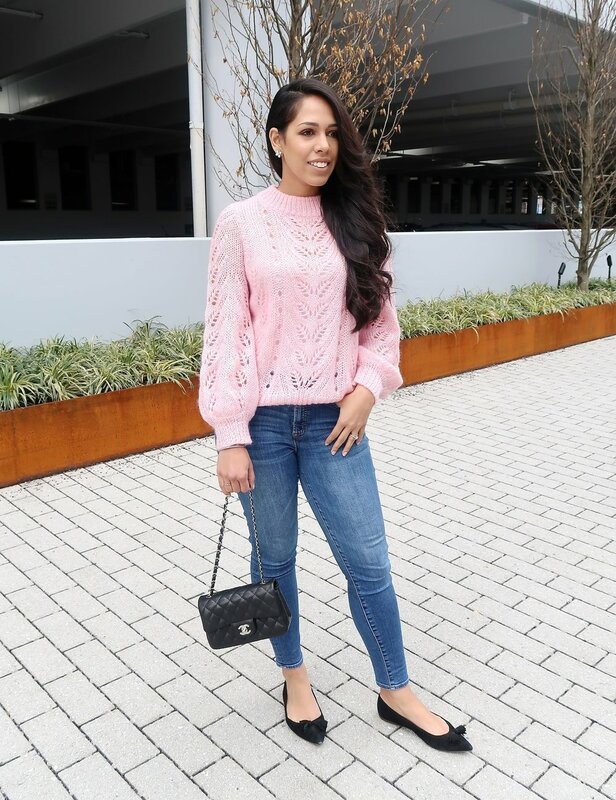 The thing I love about this knit sweater is that it is so versatile and looks great paired with just about anything - jeans, white jeans, shorts! (Can you tell I'm all about versatile pieces?!). Since it was a little chilly out, I paired this knit sweater layered over a dress shirt. 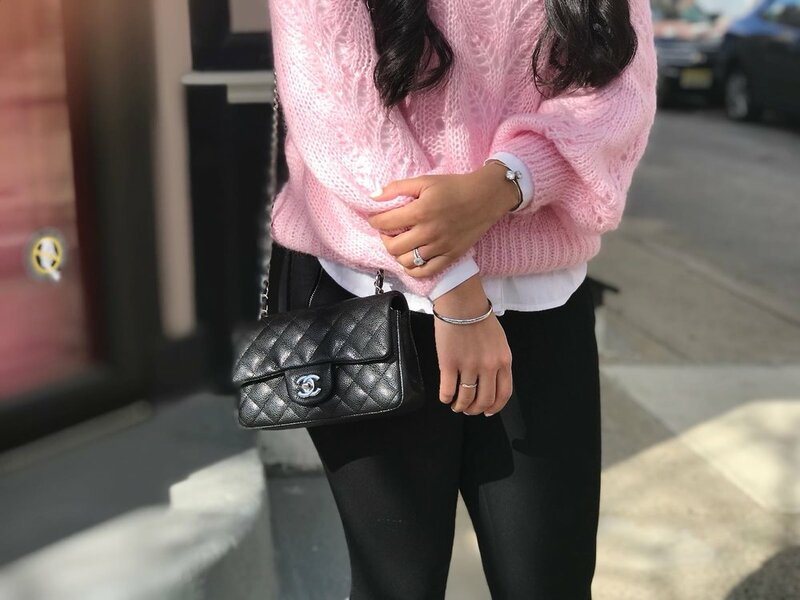 This knit sweater is seriously so cozy and just looks so much more expensive than it really is. I really like that the knit pattern is a loose hole pattern and balloon sleeves. So this upcoming weekend I am heading up to Connecticut to my parents house to spend Easter with them! I haven't been back home since January so I am super excited to spend some quality time with them! Anyone have any fun things planned this weekend?